The CDC has released important information on dealing with the prescription opioid pain medication and heroin epidemic. Opioids are a class of drugs that include pain medications such as morphine, oxycodone, hydrocodone, methadone, fentanyl and others and the illegal drug heroin. I’ve spoken a great deal about this problem in various other posts (see here here here and especially here and here). Just to summarize some of most disturbing trends: the US is experiencing a surge in deaths due to overdose on opioids (overdoses/year due to opioids are now greater than fatalities from car crashes), virtually all demographics (age groups, income levels, gender, race) are affected, and many people addicted to opioid pain pills transition to heroin and as such, a huge increase in heroin abuse is also occurring; teenagers and adolescents are especially hard hit. The CDC’s report, released on Friday, March 18 provides a thorough review of the clinical evidence around prescription opioid pain medications and makes 12 recommendations to help control the over-prescription of these powerful drugs in attempt to reduce the amount of overdose deaths and addiction. I finally got around to reading the whole thing and am happy to summarize its main analyses and findings. While the report is intended for primary health care providers and clinicians, the report’s findings are important for anyone suffering from short or long-term pain and the risks vs benefits posed by opioids. But before I dive into the meat of the report, I wanted to clarify an important issue about addiction to prescription opioids. A false narrative exists that those suffering from addiction are “drug seekers” and it is this group of people that is duping doctors in prescribing them too many opioids while good patients that take opioids as directed are not over dosing or becoming addicted. It’s important to remember that opioids are so powerful anyone that takes them runs the risk of overdosing or becoming addicted after repeated use. Most people suffering from addiction and overdoses during the current prescription opioid epidemic are people that used opioids medically and not for recreation. This is true for youths prescribed opioids for a high-school sports injury, and older patients prescribed opioids for chronic back pain, and many other “regular” people. The CDC released this report to help fight back against the over-prescription of opioids and the severe risks that accompany their use. Doctors and patients alike need to be aware of the risks vs benefits of opioids if they decide to use them for pain therapy. Identify relevant clinical questions related to prescribing of opioid pain medications. Prepare recommendations based on the evidence. Two types of evidence were used in preparation of the report: direct clinical evidence and indirect evidence that supports various aspects of the clinical evidence (contextual evidence). Studies included in the analysis ranged from high quality randomized control studies (the gold standard for evaluating clinical effectiveness) to more observational studies (not strong, direct evidence but useful information nonetheless). Is there evidence of effectiveness of opioid therapy in long-term treatment of chronic pain? What differences in effectiveness between different dosing strategies (immediate release versus long-acting/extended release)? How effective are the existing systems for predicting the risks of opioids (overdose, addiction, abuse or misuse) and assessing those risks in patients? What is the effect of prescribing opioids for acute pain on long-term use? Based on a close examination of the clinical evidence from a number of published studies, the CDC found the following answer to these questions. There is no evidence supporting the benefits of opioids at managing chronic pain. Opioids are only useful for acute (less than 3 days) pain and for cancer pain or end-or-life pain treatment. Opioids have numerous risks such as abuse and addiction, overdose, fractures due to falling in some older patients, car crashes due to impairments, and other problems. The longer opioids are used the greater these risks. There is no difference in effectiveness between immediate release opioids and long-acting or extended release formulation. The evidence suggests the risk for overdose is greater with long-acting and extended-release opioids. No currently available monitoring methods or systems are capable of completely predicting or identifying risk for overdose, dependence, abuse, or addiction but severak methods may be effective at helping to evaluate these risk factors. The use of opioids for treating acute pain increases the likelihood that they will be sued long-term (most likely because of tolerance and dependence). The CDC also examined what they called contextual evidence or studies that didn’t directly answer the primary clinical questions but still provided valuable, if indirect, information about treatment of pain with/without opioids. Non-medication based therapies like physical therapy, exercise therapy, psychological therapies, etc. can be effective at treating chronic pain for a number of conditions. Non-opioid pain medications such as acetaminophen, NSAIDs, Cox-2 inhibitors, anti-convulsants, and anti-depressants (in some instances) were also effective in treating chronic pain for various conditions and have fewer dangers than opioids. 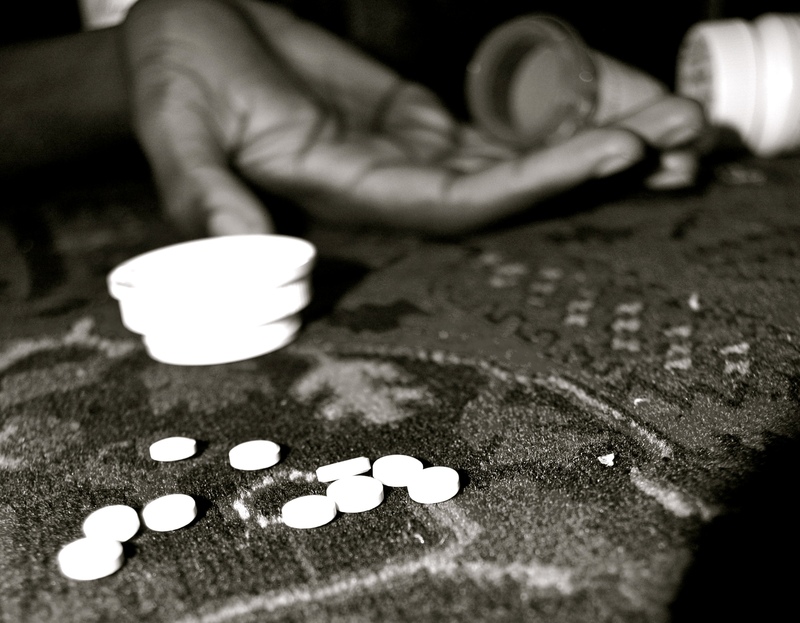 Long-acting opioids increase the risk for overdose and addiction. Higher doses of opioids also increase the risk for overdose. Co-prescription of opioids with benzodiazepines greatly increases the risk of overdoses. Many doctors are unsure of how to talk to their patients about opioids and their benefits vs risks and most patients don’t know what opioids even are. The opioid epidemic costs billions of dollars in medical and associated costs. Its estimated costs due to treatment of overdose alone is $20.4 billion. Many other findings and important pieces are information were reported but too many to list here. Based on all results of the analysis the CDC came up with 12 recommendations in three broad categories. I’ll briefly discuss each recommendation. Category 1: Determining when to initiate or continue opioids for chronic pain. Recommendation 1: Non-pharmacologic (medication-based) therapy and non-opioid pharmacologic therapy are preferred for chronic pain. 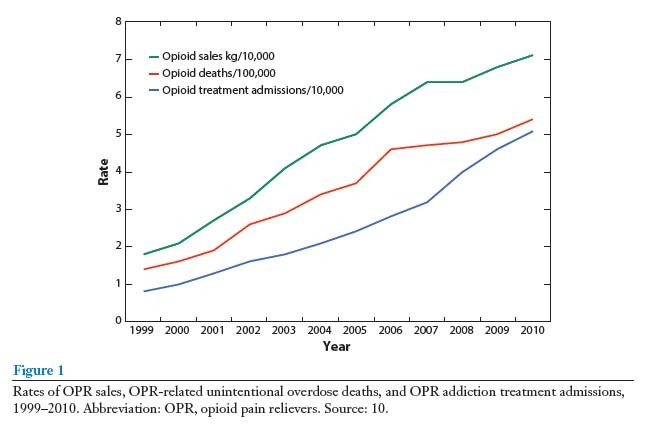 The risks of overdose and addiction from long-term use of opioids is very high and benefits for actually treating pain are very low for most people. Therefore, other safer and more-effective treatments should be use first. The discussion of the risks vs benefits needs to be made clear by the patient’s doctor. Opioids should be used for the shortest amount of time possible but if used for a long-term treatment, at the lowest effective dose. If a patient suffers from an overdose or seems as if dependence or addiction is developing, a patient may need to be tapered off of opioids. Recommendation 3: Before starting and periodically during opioid therapy, clinicians should discuss with patients known risks and realistic benefits of opioid therapy. The risks are high for the use of opioids and it is necessary for doctors to keep their patients informed about these risks. Category 2: Opioid selection, dosage, duration, follow-up, and discontinuation. Recommendation 4: When starting opioid therapy, clinicians should prescribe immediate-release opioids instead of extended-release or long-acting opioids. There appears to be no difference in effectiveness at treating pain between the different types of opioids but the long-acting opioids come with a greater risk for overdose and dependence. Long-acting opioids should be reserved for cancer pain or end-of-life pain. It’s important to note that “abuse-deterrent” does not mean that there is no risk for abuse, dependence, or addiction. These types of formulations are generally to prevent intravenous use (shooting up with a needle) but most problems with opioids occur as a result of normal, oral use. Recommendation 5: When opioids are started, clinicians should prescribe the lowest effective dosage. The higher the dose the greater the risk. A low dose may be sufficient to control the pain without risk for overdose or the development of dependence. Opioids are often most effective in the short-term and may not need to be continued after 3 days. If dosage needs to be increased, changes in pain and function in the patient should be re-evaluated afterwards to determine if a benefit has occurred. Patients currently on high-dose long-term opioids for chronic pain may want to consider tapering down their dosage. Tapering opioids can be challenging can take a long-time due to the physical and psychological dependence. Tapering should be done slowly to and the best course of dosage should be determined specifically for the patient. Recommendation 6: Long-term opioid use often begins with treatment of acute pain. When opioids are used for acute pain, clinicians should prescribe the lowest effective dose of immediate-release opioids and should prescribe no greater quantity than needed. Evidence suggests that using an opioid for acute pain can start a patient down a path of long-term use. This should attempted to be avoided by using a low dose if opioid is selected to treat acute pain. Acute pain can often be effectively managed without opioids with non-medication-based therapies (like exercise, water aerobics, physical therapy, etc.) or non-opioid medications (like acetaminophen or NSAIDs). Recommendation 7: Clinicians should evaluate benefits and harms with patients within 1-4 weeks of starting opioid therapy for chronic pain or of dose escalation. Opioids are most effective for the first three days and possible up to a week. If long-term therapy is decided upon, treatment should regularly be reassessed and reevaluated (at least every 3 months for long-term therapy). Category 3: Assessing risks and addressing harms of opioid use. Recommendation 8: Before starting and periodically during continuation of opioid therapy, clinicians should evaluate risk factors for opioid-related harms. Clinicians should incorporate into the management plan strategies to mitigate risk, including considering offering naloxone. Specific risk factors for the specific condition that patient is using opioids for should be considered when developing the treatment plan. Naloxone blocks the effects of opioids and can immediately revive someone that has experienced an overdose. Naloxone should be offered to patients if a patient is using opioids at high-dose for long-term therapy or previously suffered an overdose. Recommendation 9: Clinicians should review the patient’s history of controlled substance prescription using state prescription drug monitoring program (PDMP) data to determine whether a patient is receive opioid dosages or dangerous combinations that put him or her at risk for overdose. PDMPs are state-run databases that collect information on controlled prescription drugs dispensed by pharmacies and in some states, physicians too. 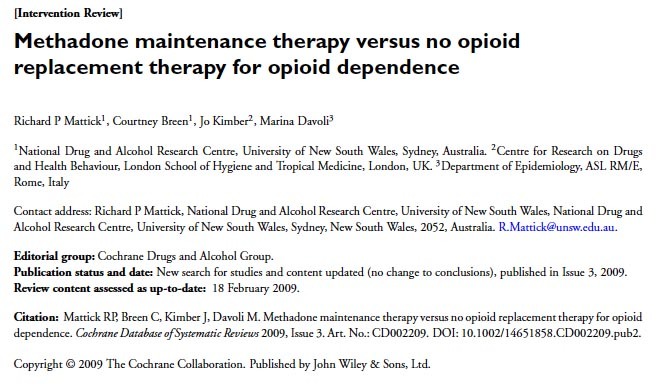 PDMP should be consulted before beginning opioid therapy and during the course of treatment if used for long-term therapy and this data should be discussed with the patient. However, PDMP data must be used cautiously as some patients are turned away from treatment that would otherwise have benefited. 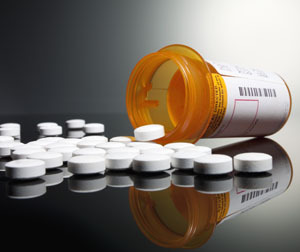 Recommendation 10: (not a general recommendation but to be considered on a patient-by-patient basis) When prescribing opioids for chronic pain, clinicians should use urine drug testing before starting opioid therapy and consider urine drug testing at least annually to assess for prescribed medications as well as other controlled prescription drugs and illicit drugs. Urine drug tests can reveal information about potential risks due to combinations with other drugs not reported by the patient (e.g. benzodiazepines, heroin). Urine testing should become standard practice and should be done prior to starting opioids for chronic therapy. Clinicians should make it clear that testing is intended for patient safety and is not intended to deprive the patient of therapy unnecessarily. Recommendation 11: Clinicians should avoid prescribing opioid pain medication and benzodiazepines concurrently whenever possible. Strong evidence suggests that many overdoses occurred in patients prescribed both benzodiazepines and opioids. The two should never be prescribed together if at all possible. Recommendation 12: Clinicians should offer or arrange evidence-based treatment (usually medication-assisted treatment with buprenorphine or methadone in combination with behavioral therapies) for patients with opioid abuse disorder (addiction). Many patients using opioids for chronic pain now may have become physically and psychologically addicted to them and should be offered treatment (estimated at 3-26% of patients using opioids for chronic pain therapy). Methadone and buprenorphine are proven, safe, and effective-treatments that retain patients in treatment and that satisfy an opioid addict’s cravings, prevent relapse to abusing opioids/heroin, and allow the patient to live a normal life (read my blog post on methadone). Behavioral therapy/individual counseling in combination with medication-based treatment may improve positive benefits of treatment even further. However, access to these medications can be extremely limited in some communities due to availability (methadone is restricted to clinics and clinicians need certification in order to prescribe buprenorphine) or cost (treatment often is not covered by insurance). Urine testing or PDMP data may help to reveal if a patient has become addicted and if so, treatment should be arranged. Opioids are associated with many risks such as overdose, abuse, dependence, addiction, and others (e.g. fractures from falling or car-crashes due to impairment). No evidence exists that opioids are effective for treatment of chronic pain (with the exception of cancer and end-of-life pain). Opioids are most effective for short term (3-7 days) and in immediate-release formulations. Non-medication based therapies and non-opioid medications are preferred for treatment of chronic pain. Doctors need to clearly explain the risks vs benefits of opioid therapy with their patients. If decided as the best course of action for a particular patient, opioid therapy needs to be repeated re-evaluated to make sure it is still working to alleviate pain. The prescription drug monitoring programs are useful tools that should be consulted prior to beginning therapy in order to help determine a patient’s history with opioids and risk for abuse or overdose. Naloxone should be made available to patients using opioids for long-term therapy in order to prevent possible overdoses. 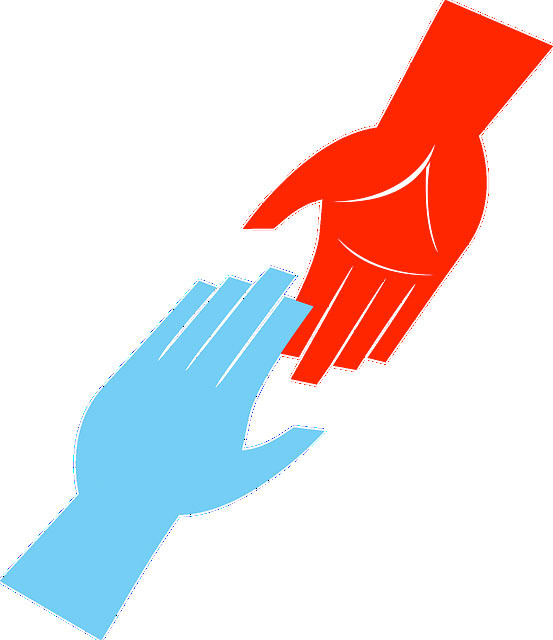 Access to medication-based treatments (methadone or buprenorphine) for dependent individuals should be provided. In 1995 Purdue pharmaceuticals released OxyContin (oxycodone, one of the most common prescription opioid pain medications) and launched an enormous push for doctors to use opioids as the primary treatment for chronic pain. The enormous surge in in prescriptions of oxycodone (500% increase from 1999-2011) followed this marketing campaign. One of the most disturbing aspects revealed by the CDC’s report is that despite this surge in prescriptions, there is a complete lack of data on the effectiveness of opioids for long-term chronic pain therapy. To be fair though, “Big Pharma” is not the sole culprit in this crisis. One argument is that pharma was responding to the need of clinicians for an increased demand by patients for management of chronic pain. It is very disturbing though that the push for the use of opioids for long-term management was initiated without any supporting evidence. This is another example of how medicine must be guided by evidence-based principles and not on personal beliefs and values or medical tradition and culture. It’s important to remember that some patients do tolerate opioids well and these patients may find them beneficial at treating their chronic pain condition. The guidelines do stress frequent reevaluation of the benefits vs risks of opioids and for some patients benefits will outweigh the risks. Finally, the CDC’s guidelines are not legally binding. These are recommendations and not laws or regulations. This means no doctors are not legally required to comply with any of the CDC’s recommendations. Hopefully some or all of these recommendations will be formalized into formal laws and regulations because many of them are extremely important in regulating these powerful and potentially dangerous drugs. NEW BLOG POST FOR ADDICTIONBLOG IS UP NOW! ALL ABOUT METHADONE. Normally a search for drug addiction in Google news pulls up a similar thread of articles: arrests of dealers and addicts, big drug busts, a crime committed by a user or dealer, somebodies mug shot. Basically, the news tends to cover only the drug enforcement and criminal aspects of the drug addiction problem. This is unsurprising since for the past few decades the lens in which we view addicts and addiction has been smeared by the “War on Drugs”, which views drug users as criminals and deviants and seeks to punish rather than treat. However, with advances in medical technology, advances in neuroscience, cognitive psychology, and a host of related fields, we understand addiction at the neurochemical and physiological level better than we ever have before. A shift in attitude that acknowledges addiction as a medical disease that needs to be treated as such (well established in the scientific community) is finally making its way into public consciousness, and most importantly, public policy. I was recently at the 2015 Society for Neuroscience Conference, an enormous gathering of neuroscientist from around the world, held Oct 17-21 in Chicago. The conference hosts an overwhelming number of lectures, symposia, and workshops for scientists to share the latest developments in research in Alzheimer’s, Parkinson’s, stroke, learning and memory, brain development, addiction, and many others neuroscience sub-disciplines. Several special lectures on neuroscience related-topics are also held and I had the pleasure of attending one of these special lectures given by the Honorable Jed S. Rakoff, Senior US District Judge for the Southern District of New York and founding member of the MacArthur Foundation Project on Law and Neuroscience, which researches issues on the intersection of law and neuroscience. Judge Rakoff spoke on how new advances in neuroscience research such as improved neuroimaging technologies and greater understanding into human cognition and decision-making, is changing how the law treats defendants. Significantly, Judge Rakoff spoke frequently about addiction, and he acknowledges what many do, that those arrested for non-violent offenses should be treated, not brutalized. However, he explained that many judge’s hands are tied when it comes to sentencing due to laws in place that set mandatory minimums for drug offenders. Judge Rakoff believes these mandatory minimum laws should be eliminated if progress is to be made toward providing treatment, rather than prison sentences, for drug addicts. It was refreshing to hear this come from such a distinguished judge and I hope it is a bellwether for changes in our legal system. Of course, laws cannot changes without lawmakers to change them. But we may be seeing the beginning of shift in drug addiction policy for the first time in years. The epidemic of addiction to prescription opioids and heroin has been making news for months now. I’ve blogged about this epidemic in several posts. One covering a review article describing the epidemic, another sharing an excellent article in the Huffington Post about the epidemic and available treatments for opioid addiction, and most recently, an important report released by the Centers for Disease Control that names opioid addiction as one of the counties top public health crises. Following this latter groundbreaking report by the CDC, policy-makers are finally starting to wake up to the problem. In a speech in on October 21 in Charleston, West Virginia, one of the areas in the country worst hit by the opioid problem, President Obama held an hour-long public forum in which he promised $133 million dollars to combating the prescription opioid and heroin problem. The President gave about a 15-minute introduction to the event, which entailed some of the most refreshing comments about addiction to ever come from a US President. President Obama began by citing shocking statistics stated in the CDC report concerning the surge in deaths due to prescription opioids, “More Americans now die from drug overdoses than from motor vehicle crashes…The majority involve legal prescription drugs.” He went on to talk about heroin as an extension of prescription opioid abuse, “4 out of 5 heroin users start with prescription opioids”. Of special significance was the shift in language he used to describe addiction and addicts, which contrasts strongly with the “War on Drugs” rhetoric of the previous administration. Obama said, “This is an illness and we have to treat is as such. We have to change our mindset”, which is something that scientists have been arguing for years but is just now being acknowledged by a US President. Point 1: Changing prescribing practices. This is necessary to stem the over prescription of opioids and the dependence to the drugs that develops in some patients as result. Point 2: Expand medication-assisted treatment programs and to make sure patients can have access to treatment and behavioral counseling that can help them. Point 3: Increased access to naloxone. Naloxone counteracts the effects of opioids and should be a standard medication on hand for any first responder that deals with overdoses. The details about implementing these strategies were not provided though. However, Obama’s speech may be coming too late, as Dr. Andrew Kolodny, founder of the Phoenix House Treatment facilities in New York, believes. As reported in New York Times, Dr. Kolodyn is disappointed with Obama’s progress and thinks he has waited too long to take action and says that opioid epidemic problem has gotten considerably worse over under Obama’s watch. I am anxious to see what changes may occur within the last year of Obama’s presidency in respect to the opioid epidemic. However, if more permanent changes are not made in the law, a conservative Republican president could easily over turn any changes made and revert to a failed Reagan-era “War on Drugs” approach. A new investigative report in the New York Times reveals a corrupt and virtually unregulated system of housing that preys on those that suffer from addiction and mental disease. Called “three-quarter” homes, there may be as many as 600 of these privately owned residences in NYC that act as a limbo between inpatient hospital care and shelters. The article tells the story of a group of homes owned by a single landlord and a few of the unfortunate residents trapped within this system. Disturbingly, reputable hospitals and treatment centers often refer patients to these homes. Landlord’s profit off of their tenant’s state-provided subsidies, which are insufficient for any other type of housing. The landlord collects the government assistance checks provided to the tenants provided that they regularly attend treatment centers. This has the unexpected consequence of incentivizing a landlord to encourage his tenants to relapse and thus remain in treatment…and in the three-quarter home. This vicious cycle is perfectly encapsulated in the articles headline “A Choice for Recovering Addicts: Relapse of Homelessness.” Read the full article for more details. However, the article neglects the opportunity to elucidate the root cause of the existence of these three-quarter homes: lack of a sufficient, standardized and coordinated health care system for the treatment of addiction and other mental diseases. A critical problem in the American healthcare system is the lack of adequate inpatient medical treatment for people suffering from addiction, and is why people get referred to the three-quarter homes in the first place. Addiction is a complex mental health disorder that requires an individual treatment plan that may involve medication, counseling, group and/or individual therapy, and other options. Without a well-funded, evidence-based, medical treatment program formulated for an individual’s addiction, they are likely to fall into the purgatory of three-quarter homes or even worse, the streets or prison. Ultimately homes likes these are allowed to exist due to the lack of adequate treatment options and facilities for addicts. And of course, the medical and treatment culture of addiction cannot be changed until the stigma against addicts and addiction is changed. Addiction is a medical disease and needs to be treated as such. There are many stigmas about addiction that are prevalent in society but the underlying cause of them all is that addiction is moral failing, even though we know addiction is a biological disease of the brain (with behavioral symptoms). In addition to being scientifically unfounded, stigmas about addiction can actually affect policy and public health decisions that have a real impact on people’s lives. In the perfect world, every decision we made would be based on concrete evidence and controlled, experimental studies. Unfortunately, this seems to be the exact opposite case for our attitudes as a society and our public policy towards drugs—ignorance, assumptions, and misconceptions seem to dominate. Nevertheless, as scientists, all we can do is the best work we can, explain and communicate the science to as many people as possible, and help to promote and support the work of others. Which brings me to today’s paper: a small pilot study that may have a wide impact on the treatment of addicts in the criminal justice system. The paper, released in the journal Addiction, looks at how treatment for opioid addiction while in prison can affect the rate of relapse to opioid abuse once inmates are released. The study recruited opioid-dependent male inmates incarcerated in New York City jails that were not interested in maintenance therapy (methadone or buprenorphine). The treatment tested is a new medication, an extended-release naltrexone (XR-NTX), a compound that blocks opioid receptors. Note on pharmacology: naltrexone is what’s known as a mu opioid receptor (MOPR) antagonist, meaning it blocks activity at MOPR (the molecular target of opioid drugs). It also has a weaker antagonist effect on kappa opioid receptors (KOPR). The KOPR plays a more complicated role in addiction, but several studies have suggested blockade of KOPR may reduce relapse. Extended release means that these receptors remain blocked for a sustained period of time after receiving the initial dose. While 152 inmates were initially interviewed, only 34 fit the criteria for the study. Many subjects were excluded from the study for a variety of reasons that would have made the study difficult to perform or the data difficult to interpret. For example, no interest, currently on methadone or buprenorphine, tested positive for opioid prior to treatment, and other reasons. The 34 subjects were randomly assigned to either the group that would receive the XR-NTX or standard behavioral therapy (i.e. no medication given to the patient). 15 (2 of the 17 refused) patients received a single injection of XR-NTX prior to release (average of 5 days before release) and 17 received no medication. Patients that received the XR-NTX were offered a second injection 4-weeks post release and 12 accepted this second injection. 6 of the 16 (1 remained incarcerated so was excluded) that received the first dose of XR-NTX had relapsed to opioid use at 1-4 weeks post-release while 15 of 17 relapsed for the control group. Urine analysis confirmed whether or a not a subject was on opioids. Granted that these are very small numbers (the authors described the study as a proof-of-principle pilot study) but the data are statistically significant. This means that the effect the experimenters are observing is most likely real and not due to random chance. The results suggest that inmates that receive the XR-NTX medication are less likely to relapse after being released from prison. These results are important because one of the problems of the US criminal justice system is that addicts are not treated while in prison. While they are abstinent while incarcerated, the underlying neurobiology of their addiction is not being treated which results in almost immediate relapse following release from prison. This of course can result in being thrown back into jail 1) if arrested while using the drug or 2) due to criminal activity to support the addiction. This cycle of addiction-arrest-incarceration-relapse-arrest-incarceration is harmful for the criminal justice system, for the addicts themselves, and for society at large (after all, we are paying for it). This study suggests addicts in prisons that are treated with medication are less likely to relapse. However, this study is extremely limited and needs to be expanded to a much larger group of inmates before any type of changes can be implemented on a large scale. Furthermore, once released, subjects need to be monitored more closely and for a longer period of time to determine if relapse rate remains low. Other medications prior to release, besides XR-NTX, should also be considered in future analyses. Most importantly, this study is an example of how treating addiction as a medical disease that requires medical treatments can actually help addicts to stay off of drugs, and hopefully, out of prison. A new paper published online in January 2015 by Kolodny et al. provides an overview of the epidemic of addiction to opioid prescription medications and heroin which is sweeping through the United States. Numerous news outlets from the Huffington Post to the New York Times have been covering this disturbing trend. This important review paper is being released at a critical time. A series of studies suggesting that long-term opioid use does not result in addiction. We now know this to be false. 4 out of 5 current heroin users report that their addiction began with abuse of OPR (See here for more information). 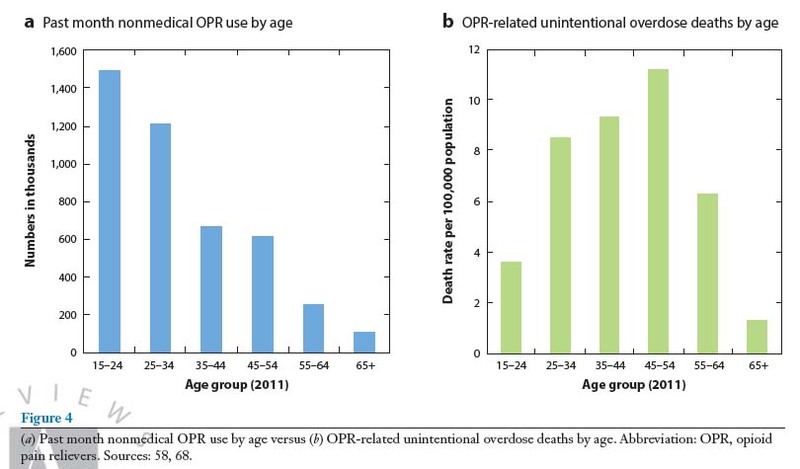 Overdose deaths and hospitalizations as a result of OPR have been strikingly high since 2002. See the graphs below. 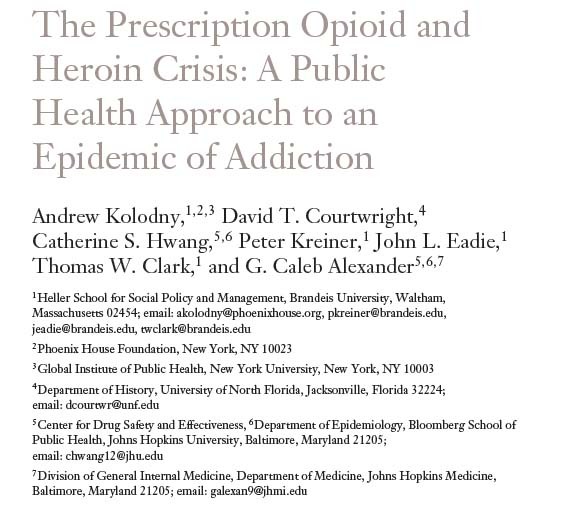 Using an epidemiologic approach, the authors outline a prevention strategy for opioid addiction broken down into primary, secondary, and tertiary interventions. The National Survey on Drug Use and Health (NSDUH) estimates 2.1 million Americans are addicted to OPR and 467,000 to heroin. A coordinated public health effort of federal and state agencies, health care providers and insurers, treatment/recovery initiatives and the research community is required to deal with this crisis. For more statistical information, consult the National Survey on Drug Use and Health. Also, see the data section of the Substance Abuse and Mental Health Services (SAMSHA) for statistics related to non-medical use of OPR and heroin.